SEO – search engine optimization – can be overwhelming to beginners. There is a science to it, though, and this online class is fully focused on giving you the insights to immediately start improving your website. 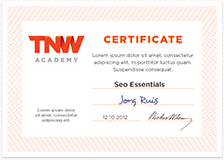 TNW Academy is the new online education and training chapter of The Next Web and this class – SEO Essentials – will be about the basics of SEO. You will learn the essential elements you should cover to get more organic traffic from search engines to your site. SEO Essentials is in collaboration with the renowned marketeer and developer Joost de Valk who specializes in (technical) SEO and works for clients like eBay, Facebook and the Guardian. In these 2 hours, Joost will tell you about the technical and content side of SEO. Who, what, when, how much and why? Why: Because after this class you can immediately start optimizing your site and get more organic search traffic.